Kingston’s DataTraveler® Generation 4 (DTIG4) USB Flash drive features USB 3.0 for quick and easy transfers of music, video and more. Its practical design and fashionable colors make it ideal for everyday use at work, home, school or wherever you need to take your data. It’s backwards compatible with existing USB 2.0 ports, allowing 2.0 users to migrate to 3.0 in the future without replacing their drive. DTIG4 is backed by a five-year warranty, free technical support and legendary Kingston® reliability. Stay organized with work or school with this DataTraveler. Compatible with Windows 10,8.1,8, 7 (SP1), Vista (SP2), Mac OA X v. 10.8x+, Linuv. 2.6x+, and Chrome OS. 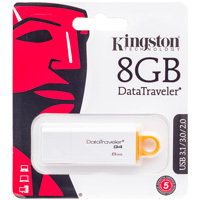 Stay organized with work or school with this DataTraveler. Compatible with, Windows 10,8.1,8, 7 (SP1), Vista (SP2), Mac OA X v. 10.8x+, Linuv. 2.6x+, and Chrome OS. Features Summary: The TI-83 Plus is an easy-to-use graphing calculator for math and science that lets students graph and compare functions, as well as perform data plotting and analysis. Its FLASH™ ROM memory allows students to update and add software applications (Apps). The 83+ is ideal for these courses: Pre-Algebra, Algebra I & II, Trigonometry, Calculus, Statistics, Business & Finance, Biology, Chemistry, Physics. Features Summary: The TI-84 Plus graphing calculator offers three times the memory, more than twice the speed and a higher contrast screen than the TI-83 Plus model. It’s keystroke-for-keystroke compatible, too. The 84+ is ideal for these courses: Pre-Algebra, Algebra I & II, Trigonometry, Geometry, Pre Calculus, Calculus, Statistics, Business & Finance, College Math, Linear Algebra, Biology, Chemistry, Physics. 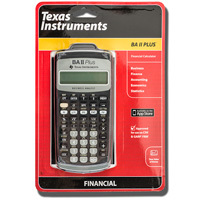 Features Summary: The BA II PLUS, our most popular financial calculator for business professionals and students. 2nd key feature to calculate terms fast. Accounting, Economics, Finance, Marketing, Mathematics, Real Estate, Science, Statistics.